May regimes of cruelty disintegrate and become extinct! Cruelty is the intentional and avoidable infliction of harm and suffering on sentient beings. In the ethics of Suddha Sanmargam, cruelty is paradigmatic of what is morally wrong and evil. Further, in Suddha Sanmargam, the prevalence of cruelty in nature and human societies is explained in terms of the ignorance of the truth of soul-kinship (the fact that another sentient being is an embodied soul similar to oneself in terms of its basic origin, nature, and predicament) and its instantiation in the form of the biological truth of the common origin, kinship, nature, and predicament of all life. The moral laws of compassion and the laws of Karma established by ARUTPERUMJOTHI have their foundations in this truth of soul-kinship and constitute the means of bringing about its realization in embodied souls (சீவர்கள்). I will elaborate in future posts on these central truths of Suddha Sanmargam. Suddha Sanmargam holds that starvation, torture, and murder are the worst harms which can befall sentient beings or embodied souls. When sentient beings or embodied souls inflict such harms on others, or when, despite having the requisite knowledge and capability, they fail to prevent, alleviate, or terminate such harms which threaten or befall other sentient beings, they violate ARUTPERUMJOTHI’S commandments of compassion designed to regulate the conduct of சீவர்கள் toward one another. As a consequence of these violations of compassion, they are subject to the unerring operations of the laws of karma instituted by ARUTPERUMJOTHI for the purpose of bringing about a moral transformation in the nature and conduct of such sentient beings or embodied souls, a moral transformation wrought on the anvil of suffering in a variety of forms. The hearts and egos of such sentient beings or embodied souls, hardened by indulgence in cruelty toward their own soul-kin, are eventually softened and transformed only by an enforced sojourn in the vale of intense suffering. In addition, such instances of suffering, whether caused by moral evil in the form of intentional violations of the commandments of compassion, or the properties of natural objects, or the laws of nature, or lack of caution in one’s actions, are a necessary condition of the development of compassion, a sine qua non, according to Suddha Sanmargam, of enlightenment or liberation. This is because compassion is, in its very nature, directed toward the prevention, alleviation, or termination of suffering. Hence, the occurrence and reality of various forms of suffering is presupposed by compassion, a sine qua non of liberation or enlightenment. Accordingly, Suddha Sanmargam does not reject the reality or value of suffering. It may be objected that invoking the law of karma, as Ramalingam does in the context of explaining the reason why some sentient beings undergo suffering from hunger, torture, murder, etc., is an instance of blaming the victims for their suffering and justifies apathy or indifference toward their condition. There is a fundamental distinction between a causal explanation and moral justification in the context of suffering. If I am given the causal explanation that I have lung cancer due to years of indulgence in smoking tobacco, this explanation does not justify apathy or indifference, on the part of others, toward my condition. Obviously, it explains why I have lung cancer, but it does not justify apathy or indifference, on the part of others, toward my condition. If someone is given the metaphysical or spiritual causal explanation that he lost his entire family in an accident due to (collective) bad karma, this does not undermine the moral requirement to extend compassion and assistance to that person. Hence, the metaphysical explanation that a sentient being suffers due to bad karma does not imply any justification of apathy or indifference toward that being. In fact, the metaphysical or spiritual theory of karma requires that one must extend compassion to the person and his departed family members for having accrued this bad karma due to their underlying ignorance (of the truth of soul-kinship) which led to their violations of the laws of compassion in their present and/or past lives. Therefore, Ramalingam’s ethic of compassion requires that we provide assistance in cases of suffering undergone by sentient beings regardless of the karmic and/or present empirical causes which brought about their suffering. Why, then, should we draw attention to the law of karma? It is a metaphysical or spiritual explanation of suffering which serves as a reminder of the truth of soul-kinship and the consequences of violating Arutperumjothi’s laws of compassion based on this spiritual truth. Therefore, on the path of Samarasa Suddha Sanmargam, there is a solemn moral obligation to refrain from cruelty, to do one’s very best in preventing, alleviating, or terminating cruelty, and, if necessary for these purposes, to document and highlight acts of cruelty to enable their cessation. In light of this obligation, I wish to make a very small contribution by way of drawing attention, in this blog devoted to Samarasa Suddha Sanmargam, to the crimes of cruelty against the Tamils in Northern Sri Lanka, perpetrated with pathological impunity and callousness on the world stage in the 21st century, by the Sri Lankan government and military. It is worth noting that the brutal Sri Lankan military receives considerable assistance and training from the Israeli Defense Forces, an equal partner in perpetrating heinous acts of cruelty on defenseless civilian populations in the Palestinian territories and beyond. Indeed, the tactic adopted by the Sri Lankan government and military of attempting to ensure that there were no international observers in or near its killing fields, by targeting such observers and their locations or fields of operation, is reminiscent of the hoary tactics of the War Criminal IDF in the occupied Palestinian territories and in its criminal invasions of Lebanon. 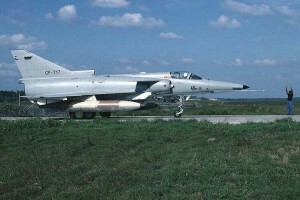 Israeli built Kfir plane used by Sri Lankan Air Force. Photo: Wikipedia. India, Sri Lanka’s morally paralyzed neighbor, also bears considerable responsibility for supporting the Sri Lankan government and military in this conflict and turning a blind eye to the latter’s horrendous war crimes against the Tamil-speaking civilian population in the areas of conflict with the Tamil Tigers (whose recourse to tactics of terror was certainly deplorable) in 2009 in the Northern territories of Sri Lanka. It should be noted in this context that the vast majority of Tamils in Sri Lanka are the descendants of the Tamils who migrated from India to Sri Lanka as early as 2nd century CE, a fact supported by the evidence of the discovery of potsherds with Tamil writing dated 1st – 2nd century CE in Poonakari, just below the Jaffna peninsula, in Northern Sri Lanka. The U.N. (which to its shame is yet to order an international probe into the war crimes of Sri Lanka’s government and military) and the world’s major powers, e.g., USA, Canada, European nations, Russia, China, and Japan also bear responsibility for failing to organize a humanitarian intervention, or any other means necessary, to prevent the mass slaughter of the Tamil-speaking civilians in the areas of conflict in Northern Sri Lanka. But, of course, it is a truism of Realpolitik that these world powers hold the U.N. captive to their Chimpanzee-style politics and intervene only when their own sordid and petty economic and/or strategic interests, or interests of criminal hegemony, are at stake and rarely on grounds which are only morally compelling. The treacherous “No Fire Zone” set up by the Sri Lankan government and military in January 2009 in the Tamil territories in Northern Sri Lanka served as a cruel trap for hundreds of thousands of civilians who flooded into the area in the hopes of finding a safe haven. This area was brutally and indiscriminately shelled by the Sri Lankan military, resulting, according to U.N. estimates, in the killings of some 40,000 – 70,000 Tamils. Macrae’s documentary shows the decapitated and bloodied bodies of men, women, and children strewn all over the treacherous “No Fire Zone”. This is assuredly the way of Ravana, the legendary demon-king of Lanka vanquished by Lord Rama in the Hindu epic Ramayana, and not the way of the Buddha! A salient truth pointed out by a U.N. worker, Peter Mackay, who was trapped for two weeks in this vicious and cruel farce of “No Fire Zone”, is the fact that the Sri Lankan military set up the zone within the range of all of their artillery. Why would they do this if their goal was in truth to provide a safe haven to Tamil civilians fleeing from the conflict? According to Mackay, in reality, the Sri Lankan army was actively targeting these defenseless Tamil civilians in their so-called “No Fire Zone”. If this is not a case of premeditated slaughter of defenseless civilians based on their ethnicity, and, therefore, a clear case of a war crime and crime against humanity, I wonder what could possibly count as one. The documentary also describes the shelling of aid-centres and make-shift hospitals after the UN or Red Cross workers informed the Sri Lankan military, in accordance with standard practice, of their locations. There is footage showing parents wailing over their dying and dead children. Video footage or images provided by the Sri Lankan soldiers, the true sons of the demon-king Ravana, show a Tamil Tiger commander interrogated and then tortured and killed, his mutilated body in the dirt; those who had surrendered, or been captured, bound, blindfolded, and executed in cold blood; naked bodies of dead Tamil women, who show evident signs of physical and sexual abuse, filmed and accompanied by degrading comments by the onlooking Sri Lankan soldiers, and on and on. The catalogue reeks of all that has gone terribly wrong in the human condition. SHAME ON SRI LANKA! SHAME ON INDIA! SHAME ON THE U.N. ! SHAME ON THE WORLD POWERS ! SHAME ON HUMANITY!